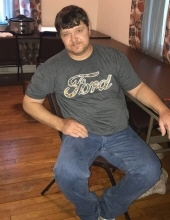 Celebrating the life of Donald Gene Goodman, Jr.
Obituary for Donald Gene Goodman, Jr.
Donald Gene Goodman Jr., 42 of Cora went home to be with the Lord on January 13, 2019 after a long battle with Cancer. Born December 11, 1976 in Holden, he was the son of Donald Gene Sr. and Minnie Davidson Goodman. Donald was preceded in death by his grandparents Henry and Dorothy Marie Goodman, Roy and Zelma Newsome, one special Aunt Christine Johnson and one Uncle Vernon Newsome. Donald attended Lilly of the Valley Freewill Baptist Church. His greatest joy in life was his sons and family. He also had a joy for UK Wildcats Basketball and WVU Football and NASCAR. Those left to cherish his memory include his loving parents Gene and Minnie Goodman, his two sons Austin "Tyler" Bledsoe of Huntington and Dustin Bledsoe of Earling, one brother James (LaDonna) Goodman of Whitman, three sisters Barbie (Perry) Osborne of Hewitt, Zelma (Kevin) Adkins of Holden, Trista Goodman of Cora, seven nephews James Goodman Jr., Lee Goodman, Christian Goodman, Justin Dowdy, Quentin Goodman, Mark Summerville Jr., and Kyle Adkins, four nieces Terra Summerville, Hayley Dunn, Jayla Dunn and Lauren Goodman, five great nephews and three great nieces, whom he loved dearly. Also leaves behind one special cousin Roylee Newsome and a special friend Doug Haga. Funeral services will be held on Wednesday January 16, 2019 at 1:30 PM at Lilly of the Valley Freewill Baptist Church at Riffe Branch, with Rev Earl White and Brother Sheldon Wells officiating and the Wells Family be singing. Burial will follow in Highland Memory Gardens at Godby, WV. Pallbearers include Tyler Bledsoe, Dustin Bledsoe, James Goodman, Lee Goodman Jr, Justin Dowdy, Mark Summerville, Kevin Adkins and Perry Osborne. Friends may call on the family Tuesday starting at 6:00PM at the church with a special Church services that evening starting at 7:00PM. In lieu of flowers, the family request that donations be made to the St. Jude's Children's Cancer research at www.stjudes.org. To send flowers or a remembrance gift to the family of Donald Gene Goodman, Jr., please visit our Tribute Store. "Email Address" would like to share the life celebration of Donald Gene Goodman, Jr.. Click on the "link" to go to share a favorite memory or leave a condolence message for the family.